Those were the words heard at an Ankara art exhibit on December 19, after at least eight shots were fired in the direction of veteran Russian diplomat Andrey Karlov. The gunman, identified as Mevlut Mert Altintas, an off-duty Turkish policeman, has since been killed in a shootout with the Special Forces. It is still not clear whether he acted alone, or had links to any group. In spite of being rushed to the hospital, the death of the Ambassador was also later confirmed by Russia’s foreign ministry spokesman, Maria Zakharova, who described Karlov’s assassination as a ‘terrorist attack’. She claimed that terrorism would not win, and promised that decisive action would take place, having received assurances from the Turkish capital that the responsible would be punished. After being informed about the events in Ankara, Russia’s President Vladimir Putin called for an emergency meeting with Sergei Viktorovich Lavrov, his foreign minister, and the heads of the security services. The Russian leader has described the act as a ‘provocation’ to disrupt bilateral ties, and Syria’s peace process. 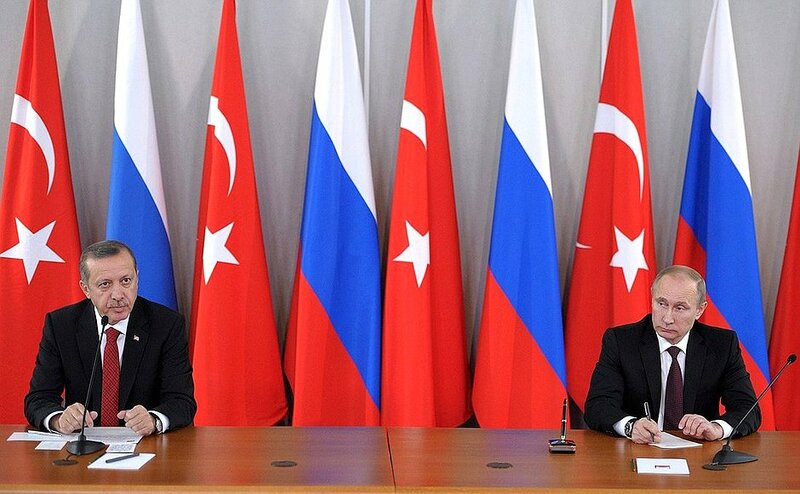 The two countries have had a particularly difficult diplomatic relation after Turkey shot down a Russian jet in November of the past year, although recent effort had been made in order to improve the relations between the two countries. Throughout the Muslim world, outrage has been soaring regarding Russia’s part in the destruction and killings that occurred in the Northern Syrian city of Aleppo. In recent days, there have been regular protests in front of the country’s Embassy in Istanbul, often involving a considerable Islamic contingent. Even though Turkey and Russia have been on opposite sides of the Syrian conflict, they have recently started to collaborate in the evacuation of civilians from Aleppo, with Karlov assuming an important role in the discussions between the two countries. Mevlüt Çavuşoğlu, the Turkish foreign minister, is scheduled to travel to Moscow on December 20 for further discussion on Syria with his Russian and Iranian counterparts, a meeting that is still expected to occur. The diplomat shared his grievances over Karlov’s death, and hoped that his assassination would not “cast a shadow on the Turkish-Russian friendship”. The same message was voiced by Recep Tayyip Erdogan, Turkey’s President, having spoken with Putin on the phone. The United Nations have condemned the attack on the Russian Ambassador to Ankara, emphasizing that an attack on a diplomatic figure could not be justified and that the perpetrator would have to be brought to justice. Federica Mogherini, the European Union foreign policy chief, has also expressed her shock over Karlov’s assassination. In behalf of the EU, she condemned the attack and shared her solidarity with Russia. The ‘cowardly’ terrorist attack has also been condemned by Syria, through a message sent by the country’s state-controlled media. U.K. Foreign Secretary Boris Johnson and U.S. State Department spokesman John Kirby have also reacted to the events that unfolded, condemning the Karlov’s assassination. Turkey has been the target of a series of terrorist attacks in the past year, which have been blamed on Kurdish militants. However, this may be the first assassination of any Russian diplomat since 1927, when Pyotr Voykov, a Soviet Ambassador to Poland, was shot to death in Warsaw.